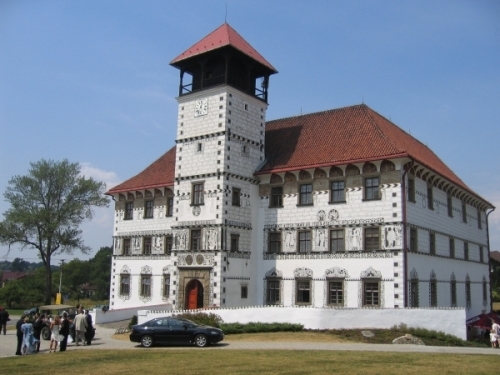 The chateau´s renaissance facade is well visible from the main road from Ostrava to Príbor. Fromaly medieval water fort, rebuilt in 1565-70 to a renaissance chateau, is used today as a municipal office and cultural centre. The chateau is a small, but very valuable pearl of renaissance in the north Moravia. In 1704 the chateau burnt down and the sgraffito plaster was covered by ordinary plaster. In 20th century the building had been declined, in adition it bunt down once again in 1945 during the liberation from nazis. The reconstruction of the chateau and sgraffito plaster begun in 20th centuries´ 50-ties. Today the chateau is used as a place of concerts, weddings etc. Once a year a folklore groups parade "Stara ves´ chateau summer" takes place here. Parking is possible either in a marked parking close to the chateau or by the park. Beware (mainly during weekends) of muggles. Do not be aware of using the hint!